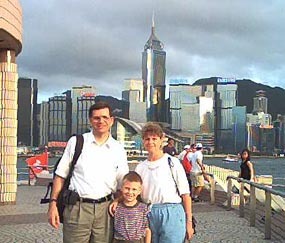 (Left) Hong Kong was our first stop when we moved to China in June 2000. The "big city" is certainly one of the most impressive places in the world, but Hong Kong also has many "outlying islands" with a very different flavor. On Cheung Chau Island (center and right--plus photo at the bottom), no cars or trucks are allowed, and many people enjoy hiking and swimming here. 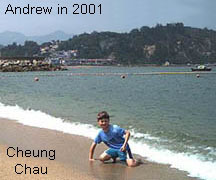 We stayed on Cheung Chau in October 2001, while attending Jian Hua's 20th anniversary celebration in Hong Kong. Michael also had a conference there in 2004, at the same place as his first Asian conference way back in February 1985! The Hong Kong skyline has certainly changed a lot since the 1980s (this photo was taken in 2006). We enjoy the many facets of Hong Kong, and with Macao a short distance away, the area provides a great place to visit. It is also the International Headquarters of the Jian Hua Foundation (JHF), which has been helping people like us to serve the people of China for more than 20 years. 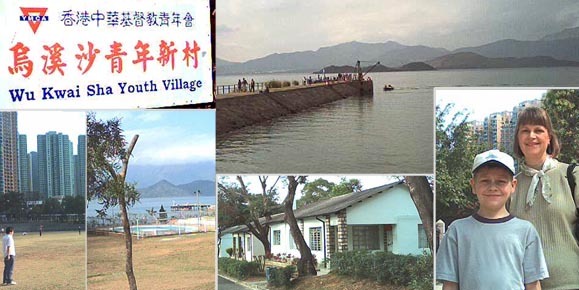 In 2003, 2005 and 2006, JHF held it's annual conference at the Wu Kwai Sha Youth Village. We understand that the camp will be used in 2006 and 2007 to help train athletes for the 2008 games in Beijing! (Montage photos from bottom left: soccer field in the shadow of nearby high-rise apartments; camp pool/pier/seaside; our cottage in 2003; Vivian and Andrew--2003; and the camp pier.) Andrew's favorite part of the annual conferences is the chance to "run around" with kids his age; they enjoy the camp's soccer field, beach and indoor recreation/game room, in between special meetings designed to help "second culture" kids cope with the challenges of living abroad. Meanwhile, Vivian and Michael enjoy encouraging sessions with gifted speakers and colleagues who also work in China. Every year we learn a lot and have a great time! The following is a test. I want to see the difference on screen.  The left photo is saved at 72 dpi; the right one was saved at 132 dpi. 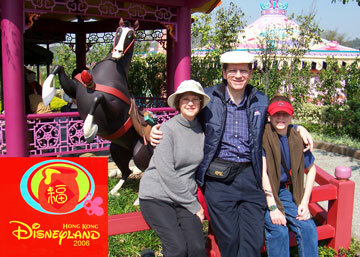 Hong Kong's Disneyland opened in 2005. We spent a day there just after Chinese New Year in February 2006. Park admission plus lunch for the three of us cost about 1000 RMB, which is a huge chunk of Michael's monthly salary as a university English instructor in China. 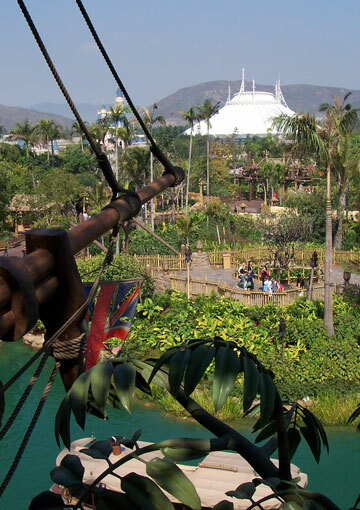 Space Mountain towers over a diminutive Fantasyland castle from this vantage point in Tarzan's tree house above the Adventureland Cruise. Michael was the captain/host for a similar boat ride at Cedar Point Amusement Park back in his college days. The tattered Union Jack in this photo is the only British flag we've seen in Hong Kong since 1997! Mulan's (plastic) horse was about the only famous Disney character that we could get a photo with without waiting in line for 30 minutes. But the weather was great and Andrew had a good time, especially on the Space Mountain roller coaster. 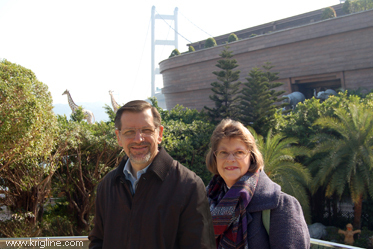 When we are in Hong Kong, we enjoy the Sunday gathering at St. Andrew's church on Nathan Road in Kowloon. 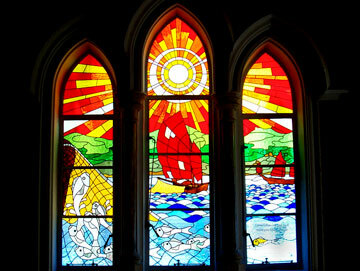 This is one of the beautiful windows in this place that has served the people of Hong Kong for over 100 years. 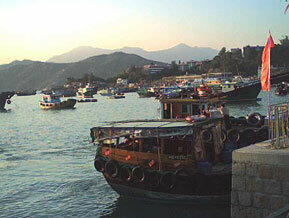 Michael participated in Jian Hua leadership meetings on Cheung Chau Island in 2011. While buildings continually get taller and streets get busier in China and Hong Kong, this quiet island stays pretty much the same. After the meetings, we enjoyed a nice seafood dinner overlooking this harbor.